Orlando, FL (March 20, 2017) – OASE, the global leader in creative water design, is pleased to introduce a new line to its impressive collections of sleek, low-maintenance biOrb® aquariums. 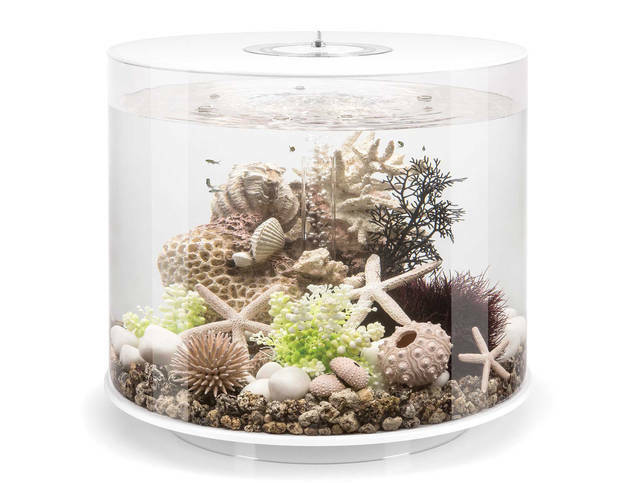 The new biOrb®TUBE aquariums feature a cylindrical-profile with a unique 360° transparent view and an unprecedented array of multi-color LED lighting options with easy remote control customization. The line will be launched in North America at the Global Pet Expo (GPE) in booth 5191 in Orlando on March 22. The modern TUBE collection is crafted with durable acrylic that achieves increased visibility over typical glass aquariums, while also enhancing the awe-inspiring LED illumination options. Available with standard or multi-color remote-controlled LED lighting, the minimalist design of the TUBE can set the ambiance of a room or blend easily into the décor of any home. The TUBE is available in either a stylish white or black trim and sized to accommodate four or nine-gallons of water. The biOrb TUBE provides the ideal aquarium environment with crystal clear, highly oxygenated, pH-balanced water paired with the perfect amount of beneficial bacteria. This is achieved through the patented biOrb five-stage filtration and underground filter. The concealment of the filter, along with the specially designed ceramic media substrate, sets the TUBE apart from the conventional aquarium’s unsightly hang-on filters. biOrb has designed filtration where it is needed most and where waste naturally settles, at the bottom. This coupled with an easy-to-change filter cartridge makes ongoing TUBE maintenance a breeze. To learn more, call 888-755-5646 to speak to an OASE representative.